I gave up trying to find an acceptable foam play mat for Fergus and Sweet William. Many mats are made from EVA (ethylene vinyl acetate), which is safer than PVC, but doesn’t guarantee that they are free of endocrine-disrupting phthalates. Some manufacturers will not say that their mats are PVC-free. Some mats are treated with flame retardants. Back in 2010, independent testing revealed that foam mats made in China contained formamide, a toxic industrial chemical; France and Belgium subsequently pulled them from store shelves. A couple of weeks ago I discovered that Under the Nile makes rag rugs from scraps of its 100% organic cotton fabric. I ordered one, specifying “boy colors,” and received this beautiful, 4 x 6 foot rug, made from the same fabric as Sweet William’s onesie and Fergus’ convertible “baggie.” It’s easy to fold up and move around and it’s a great surface for the boys to play on. Problem solved! I’m considering buying the play mat by Under the Nile. Does it provide a non-slippery base for infant to learn to crawl on? I’m wondering if it bunches up or gives the baby the purchase needed. 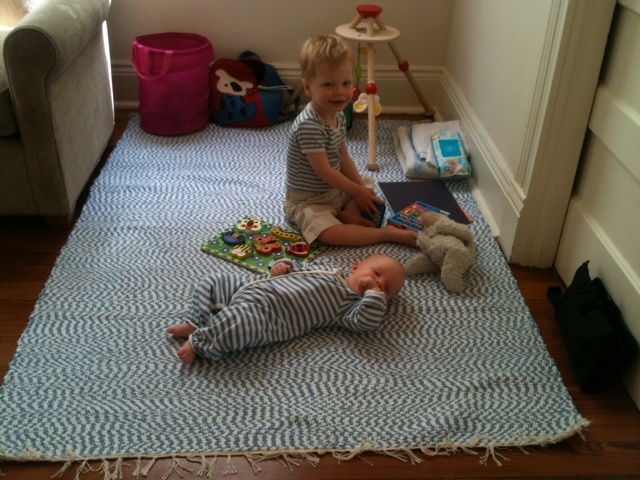 In our experience, Under the Nile’s play mat is heavy enough to lie flat and not slip while Fergus and William play on it. I think the woven texture is a very nice surface for them to crawl, sit, and stand on. It doesn’t have a lot of padding like a foam play mat does, but it worked just fine on our hardwood floor. I think you’ll like it. Thanks for writing! Thank you SOOOOO much!!! This being green thing isn’t always easy or cheap, and mistakes can be expensive- so am extremely grateful for your opinion!!! Hi, I am interested in purchasing one of these mats, but I would like to know if it can be washed in my washing machine (at home, not in a commercial machine). Have you successfully fit it into a washing machine? Also, is that a wooden puzzle I see in the first picture? Would you mind telling me where you found it? I am looking for safe wooden puzzles for my 12-month-old. Yes, I wash it in our home machine. (I’m always reluctant to use commercial machines because of the soap residue from previous loads.) I also tumble dry, though I usually take it out while it’s still damp and reshape it a little bit. I love being able to wash it regularly and get rid of the accumulated dust. The puzzle in the photograph is a Melissa & Doug puzzle that my boys received as a gift. I honestly don’t know how to rate Melissa & Doug products. The last time I checked them out, their documentation of non-toxicity wasn’t totally satisfying. These puzzles have printed paper glued onto the wood pieces, and the paper starts to wear away. I took the puzzle away when Fergus started chewing on the pieces. It’s funny that you ask about this now, because both William and Fergus have shown more interest in puzzles over the last couple of weeks. I’ll look for a safer puzzle and will let you know when I find one! Hello! 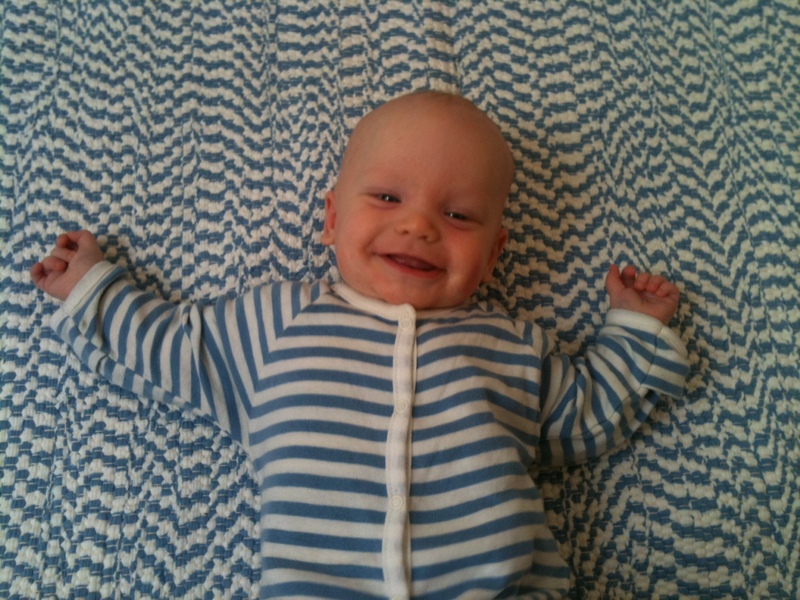 I’ve been looking for a healthy play mat and came across your article. I guess now I can give up trying to find a foam play mat, too! Thank you!